Cleaners and dishwashing products do not need toxins to do the job! Our products clean well, scrub effectively, shine surfaces . . . they perform well without adding pollutants to your home environment and ultimately after the task is done, they do not end up polluting our streams, rivers and oceans. Mild and pure plant-based cleaning agents make this a gentle, effective, economical dish liquid. No toxic ingredients. No synthetic colors or perfumes make it a great choice for people with skin sensitivities. Lightly scented with oil of orange. Biodegradable. 32 oz. 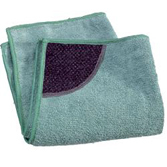 Durable, reusable, long-lasting kitchen cloth with special non-scratch scrubbing pocket. Removes 99% of bacteria. Just use with water. Save money by reducing the use of paper towels and cleaning products. The alternative to paper towels. 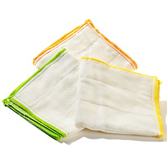 Reusable, absorbent cleaning cloths that stay soft and fresh use after use. Naturally bacteria resistant. No sour smell. 3 per pack. Color coded for different uses. Non-toxic, ammonia-free, and streak free with a fresh citrus scent. Great for cleaning glass and much more! Safe to use around kids and pets. 22 oz.